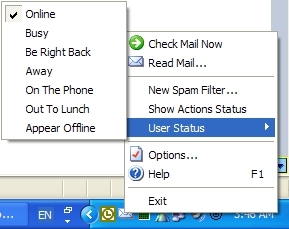 This shareware program automatically checks multiple e-mail accounts (POP3 or IMAP4), alerts with sound, delete spam, set up reminders and forwards compressed new e-mail messages and reminders to other e-mail address,pager,and cellular phone even when your e-mail program is not running and depending on your status (online, away, busy..). Running from the system tray, it launches your default e-mail client and alarms you when the Internet is down. ...... the Internet is down. The program runs in Windows 95-98, Windows NT-2000, and Windows XP and allows automatic updates. After trial expires, the program will work with limited functionality. Qweas is providing links to mobile4you 2.1.2.77 as a courtesy, and makes no representations regarding mobile4you or any other applications or any information related thereto. Any questions, complaints or claims regarding this application mobile4you 2.1.2.77 must be directed to the appropriate software vendor. You may click the publisher link of mobile4you on the top of this page to get more details about the vendor.